simulating the effects to the mattress when people sleep and roll on it. simulate a people sits on the edge of the mattress,and the effect caused by the bottom loading on the mattress. damage to before and after the test.Assess the quality of the mattress quality. operation more reliable and test data more accurate by using advanced control system and optimized structure. technology sense because Sheet metal parts of it is made by advanced electrostatic spray painting process. 4.Built-in sample,Provide more safety testing process, prevent the machine from injuring . 5.Switches are distributed in many places which can make sure that we can turn off them in case of any emergency. operate.The testing process and the running status is clear to us, test times can be set freely. the roller and make its own weight fully load to the surface of the mattress. 3.Roller can move up and down in the testing process, to adapt to concave and convex surface of the mattress. 4.When doing durability test of edge, roller can be moved to the parking area behind the instrument. 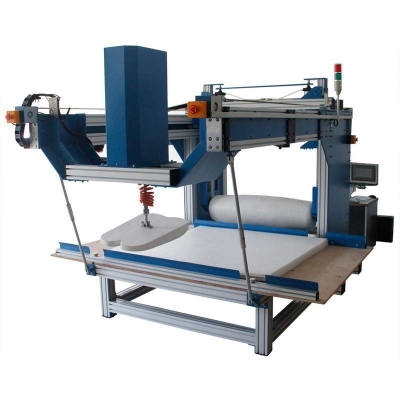 5.Durability test for cushion surface is driven by servo motor,it is quiet,steady and reliable to operate. the home position automatically.Both stroke end auto-induction,parking area position sense. 2.Special test software on PC, WINDOWS operating page, a high degree of compatibility. convenient for operator to learn and save the training time. 4.The curve window of test software display the values of force and shift in real time,multi-coordinate model. 5.Measured results can be output into editable test report, high compatibility and editable with WORD format. 6.High precision force sensor, loading force value accurately. 7.Servo motor and ball screw pair drive, stable and reliable operation, high control precision, and loading speed can be set. 8.Using high resolution encoder sensing displacement, displacement precision is high. driving device, save space and cost. of the mattress.It is different from the tradition way to separate .The test can be finished without moving the sample. 12.Force sensor avoid overloading damage to the core components. 1.Rolling test stroke:The mattress mid-line left and right are both 500 mm. 4.Counter:0- 999999 can be set. 7.Loading parts on the edge:The midpoint on the long edge of the mattress.200 mm from edge. QB/T 1952.2-2011 and so on.